If you’ve had even half an eye on the fly fishing shelf at your local bookseller or library over the past thirteen years, you will be at least passingly familiar with the work of artist and fly angler emeritus James Prosek. 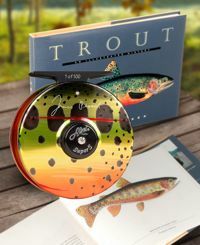 His book Trout: An Illustrated History, a collection of paintings of the trout of North America (published when he was only nineteen) quickly established Prosek’s work as the gold standard in the world of angling art. This was followed by nine more books, including Fly Fishing the 41st, Trout of the World, and the excellent children’s books A Good Day’s Fishing and his latest offering, Bird, Butterfly and Eel. His website is worth a look, too. Prosek’s current work has him exploring man’s changing relationship with nature; specifically, the way humans alter their perception of nature by naming things, which he discussed with Krista Tippet on the public radio program Speaking of Faith in 2008. This segment, entitled “Fishing With Mystery”, will re-air on public radio stations around the country beginning Thursday, August 6 through Wednesday, August 12. You can read all about the show on Speaking of Faith’s website. To find out when the program will be broadcast on your local public radio station, click the “stations” link on the show’s site.